I have been a business owner and happily married to my wife Stephanie for 25 years. I am a father of four. I have three sons, one wonderful daughter and we have been blessed with 9 beautiful grandchildren, who all call me “Pappy.” I served in the United States Air Force from September 1st, 1982 through December 31st, 1985 and ended abruptly do to a motorcycle accident. My career as an environmental support specialist was over, resulting in a new chapter in my life. 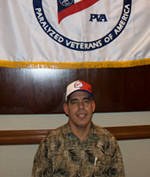 I am a life time member of the PVA and been involved with the TPVA for the for the past 31 years. As soon as I was able I began giving back to TPVA. I have served on the TPVA BOD for the past nine years. Since serving on the board I have helped start and organize several new events and fundraisers all which have become very successful. I have also had great success with bringing several name brand sponsors.I keep in close contact with Presidents, CEO’S and company Representatives, to make sure that they will continue to help promote and donate to TPVA.